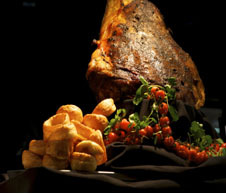 Frank Coughlan, the executive chef at Wembley Stadium in the UK, recently shared with me the below step-by-step guide to preparing a steamship of beef. I thought I would share with you via pictures. Enjoy. I will blog again soon. 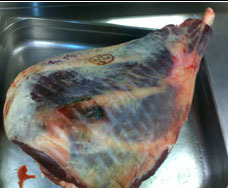 The Steamship Joint must be purchased raw from the butcher and the bone needs to be French trimmed. It must only be done on the whole muscle meat; not boned and rolled products. 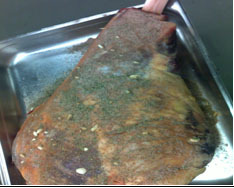 Marinate the Steamship 48 hours before cooking. Use the recipe listed for the marinade. DO NOT deep skewer meat to the bone. 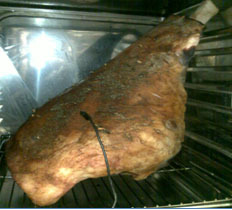 Place Steamship in the oven on overnight cook on high seal of meat, then on cooking mode. Set the core meat temperature at 60 degrees. This will take up to 14 hours. 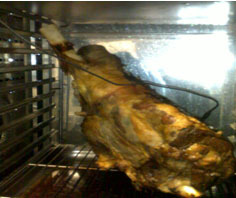 •	When meat has reached a core temperature of 60oc, the oven will go onto ‘Hold Mode’ until the joint is ready to be moved to the buffet. Make sure the steamship is transferred to the hot box with at least two chefs lifting the joint. To present the Steamship, place on a Hot Plate with a Carving Light and serve with Yorkshire Pudding & fresh bread rolls, mustard and horseradish. This entry was posted on Monday, December 6th, 2010 at 10:49 pm and is filed under Uncategorized. You can follow any responses to this entry through the RSS 2.0 feed. You can leave a response, or trackback from your own site. One Response to Steamship of Beef.